Evan White does not have any MLB stats for the season. Draft: 2017, Seattle Mariners, 1st rd. April 24, 2019 Arkansas Travelers activated 1B Evan White from the 7-day injured list. April 12, 2019 Arkansas Travelers placed 1B Evan White on the 7-day injured list. 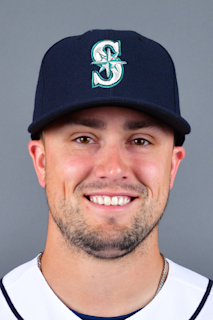 March 19, 2019 1B Evan White assigned to Seattle Mariners. January 24, 2019 Seattle Mariners invited non-roster 1B Evan White to spring training. June 12, 2018 1B Evan White assigned to Modesto Nuts from Tacoma Rainiers. June 8, 2018 1B Evan White assigned to Tacoma Rainiers from Modesto Nuts. April 10, 2018 1B Evan White assigned to Modesto Nuts from Everett AquaSox. February 24, 2018 1B Evan White assigned to Seattle Mariners. September 29, 2017 Everett AquaSox activated 1B Evan White from the 7-day disabled list. July 15, 2017 Everett AquaSox placed 1B Evan White on the 7-day disabled list. June 23, 2017 1B Evan White assigned to Everett AquaSox. June 18, 2017 Seattle Mariners signed 1B Evan White.